I installed Windows 10 on a physically German keyboard, then installed an English keyboard and bought some little stickers to make my keyboard look OK. 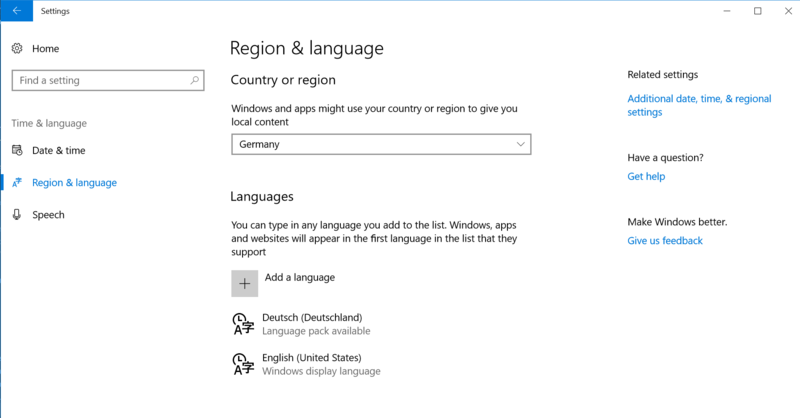 However, Windows shows 2 keyboards installed & occasionally toggles back to German. Note that I am not talking about removing a language (which is all that I can find when I Google). How do I remove the German keyboard? Edit: This section of the control panel has been removed from newer versions of Windows 10. You need to use the settings app instead. Open Control Panel, under the Clock, Language and Region heading click Change input methods, you should see your language, click on Options, in the Input method section you should see two entries, remove one. Use regedit to navigate to HKEY_USERS\.DEFAULT\Keyboard Layout\Preload. You will find there the list of keyboards that are preloaded at boot. In Widows 10, on the Control Panel, I chose "Languages". There was a rectangle labelled English and next to it was some text saying "keyboard layout: English, German". I clicked on that box and then there was an option to remove each keyboard. I have searched through every possible selection under Language and Region and this is the only way that I found to remove keyboard. I hope that this will be of use to other in future. It's not a 100% solution but at least it will fix random keyboard layout swaps. When all the solution above don't help - open registry editor (WinKey + r -> regedit), edit Languages under Computer\HKEY_CURRENT_USER\Control Panel\International\User Profile\ to list desired keyboard layouts and restart computer. I don't know why but I don't have any of the above options in the Control panel. I have Clock and Region (no Language mentioned) and inside cannot set the language. If I click the ENG on the language bar in the tray I finally get: Language Preferences. Choosing that, takes me to the Languages control panel. 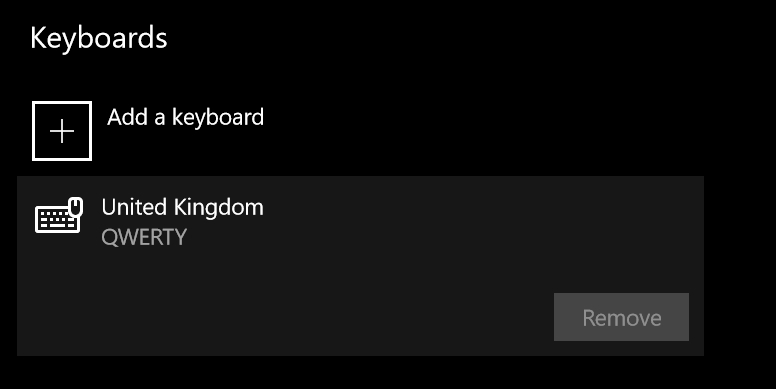 I cannot delete the UK keyboard (I have Israel and the US keyboard set, and Hebrew as a second language). Standing on the UK keyboard the Remove button is disabled. Deleting the UK key (809) from the registry Computer\HKEY_CURRENT_USER\Control Panel\International\User Profile\Languages should do the trick (in older versions it was a different key with a dword for each language: 409 was English US, 40d is Hebrew, 809 is UK) Thanks Ohad!!!! I had to go under the Region and Languages Settings panel, Advanced Keyboard Settings, and Override for default input method. Rebooted and all's ok now. 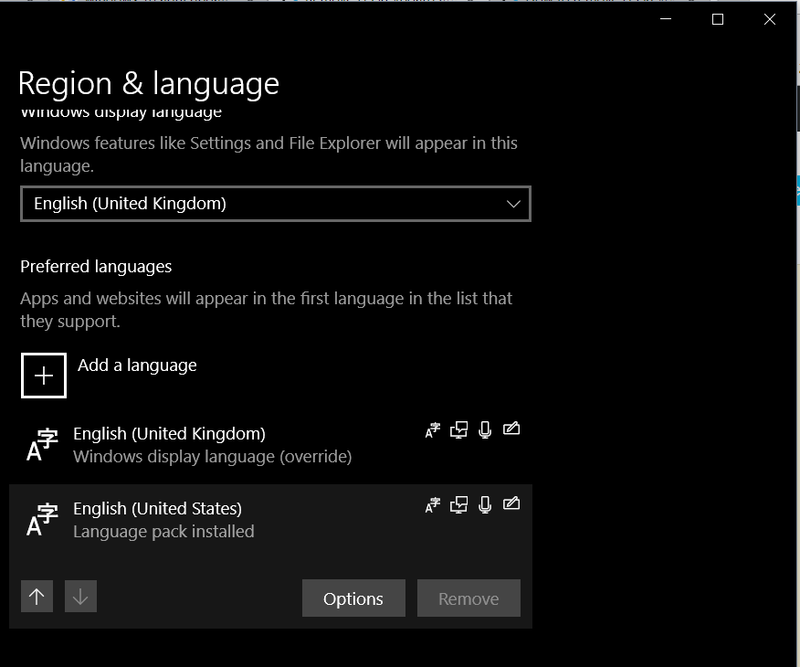 After last windows update, I found English (Great Britain) in my languages list, since I'm used to US non-letters layout, and I need to switch languages quite often, and this drives me crazy - changing languages twice every time, and non of the above options works - I've tried that option. Let's hope it won't get back in the next windows update. Solution: go to C:\Windows, look for a folder named as the layout you want to remove (en-GB in my case) and remove it / change it's name. Sometimes display languages keep adding themselves to keyboard layout lists. 3) choose "uninstall display languages"
4) choose the language you want to remove and click "next"
Not the answer you're looking for? Browse other questions tagged windows-10 keyboard-layout or ask your own question. 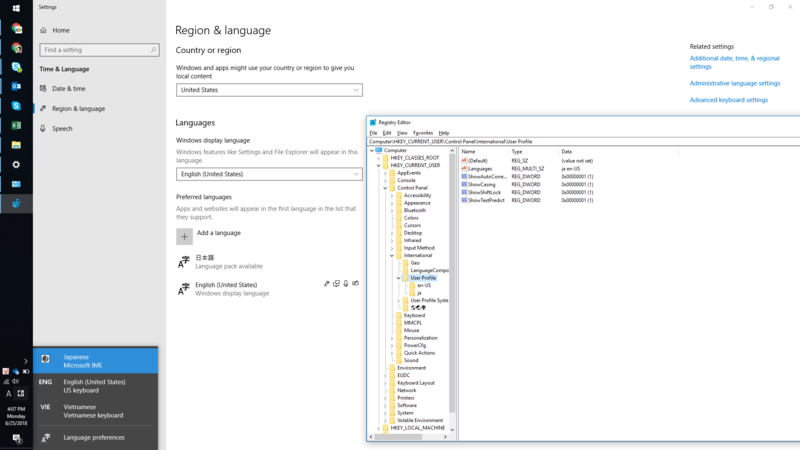 How do I remove English (US) from Windows 8.1? How to delete a keyboard layout in Windows 10? Why does Windows 7 always automatically change the input or keyboard language? How can I remove a keyboard layout that isn't listed in the control panel?